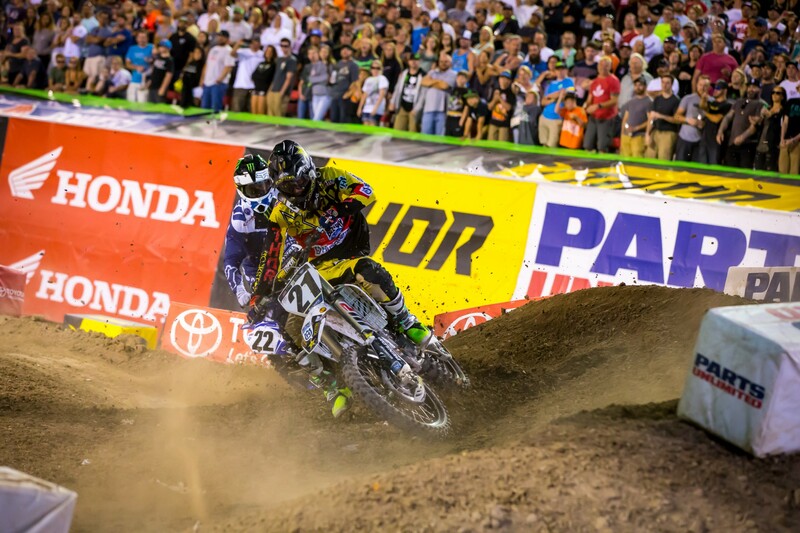 It was perhaps the most heart-stopping hour of supercross racing in the history of the sport. Not one, but two championships came down to the final turns of the final lap, with ever-changing storylines throughout the races, each tale wrapped around one simple truth: when everything is on the line, anything goes. The craziness started immediately in the 250SX main event, which is called the Dave Coombs Sr. East/West Showdown at the finale. Three 250SX East riders, Jordon Smith, Joey Savatgy, and Zach Osborne, were separated by one point going into this final round, but Osborne crashed in the first turn and found his bike locked with Dakota Alix. Osborne actually had to grab Alix’s bike and rip it off of his (Alix’s footpeg was wedged in Zach’s front spokes), so by the time he was going, he was 21st and far, far back. Only two laps in, Savatgy crashed, leaving Smith with an edge, until he cased a jump and bounced off the track, and then later wadded hard on the big ski jump and sand rollers. The crash ended Smith’s night, and served to prove how championship pressure was indeed going to impact the proceedings. Smith was too banged up to continue, but later revealed he was sore but uninjured. Savatgy, apparently, wasn’t feeling much better. 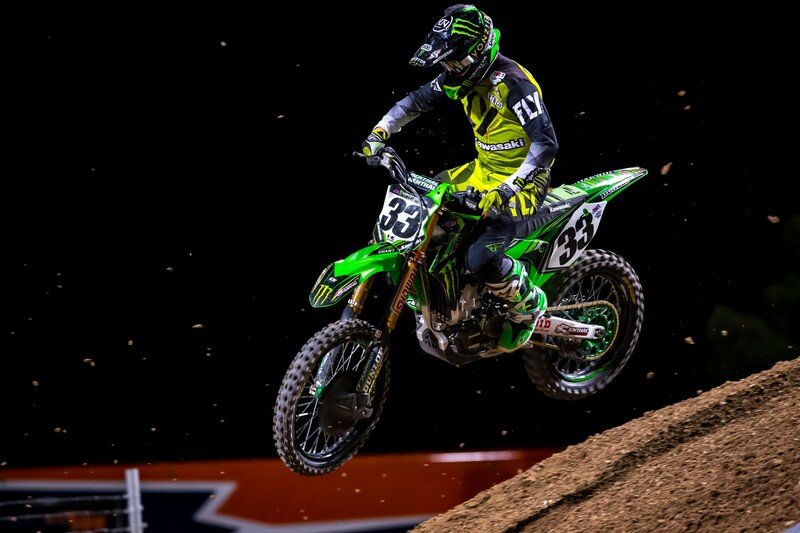 He was struggling and going backwards, and with Osborne only up to 18th and Smith out, the points began to shift in the direction of … Adam Cianciarulo? AC holeshot and led, and although was 14 points down coming in, he had made up 13 on Savatgy and needed just one more pass to tilt things in his favor. GEICO Honda’s Cameron McAdoo closed on Savatgy to make the threat real, but then the rookie went off the track. But then … came … Osborne! He rode like a man possessed on the final laps, just as Savatgy found himself locking up and unable to charge. The potential of Cianciarulo, Savatgy, or Osborne winning the title was very real with two laps to go. Osborne had a brief battle with Mitchell Harrison, then Savatgy passed Hayden Mellross, then Osborne got Mellross on the last lap and got Savatgy within his sights. In the final whoop section and bowl turn of the race, Osborne unleashed everything he had, sending it through the whoops and into Savatgy’s side in the corner, smashing the Kawasaki rider to the ground, taking the seventh spot, and with it the title in a most remarkable ride after being buried and locked up in turn one. It had literally come down to the next-to-last turn on the last lap! 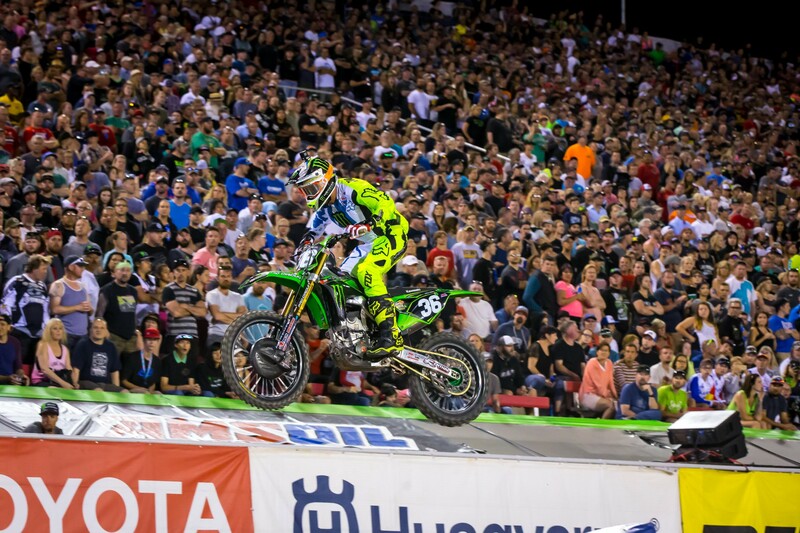 Osborne’s pass on Savatgy was ultra-aggressive, but it ultimately delivered a championship. Cianciarulo won the race and somehow ended up just two points down in the final standings. 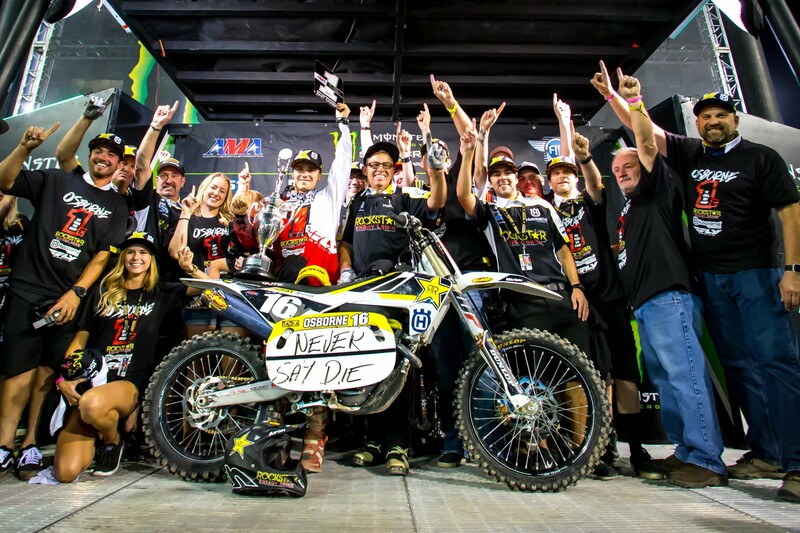 Justin Hill, who had already clinched the 250SX West Region championship, finished second and Aaron Plessinger took third. Safe to say hardly anyone noticed or watched them as all eyes were on the unfolding Osborne/Savatgy/Smith drama spilling out all over the track. The incredible 250 race should have been the crescendo on the night since the 450 title scenario looked tame in comparison. Eli Tomac stood nine points behind Ryan Dungey, so Dungey just needed fourth or better to claim the crown, and Dungey had not finished worse than fourth in three years. Tomac, however, had a plan. Dungey holeshot the main event. Tomac quickly shuffled around Blake Baggett into second and found an opening on Dungey in the same bowl turn Osborne used to knock down Savatgy. By now everyone knew the potential that corner held for chaos, and Tomac came into Dungey with contact and nearly knocked him off the track. Dungey stayed upright in second. From there, Tomac could have just taken off with the win and hoped some miracle bad luck would strike Dungey, but he instead chose to make things happen. 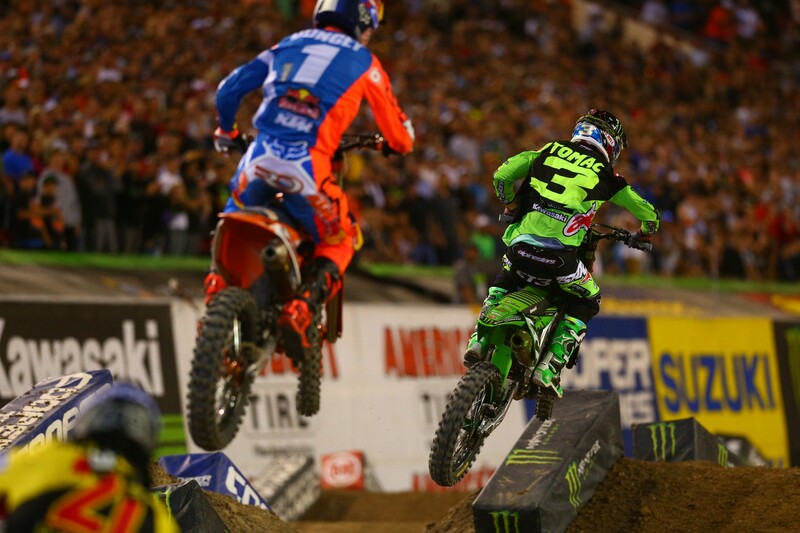 Instead of pulling away, Tomac slowed, letting Dungey catch back up and baiting him into a battle. Dungey didn’t want to engage and give Tomac another chance to hit him, so he tried to just ride behind him for awhile, but soon, Tomac’s master plan started to unfold. A pack of riders—Jason Anderson, Baggett, Josh Grant, and Chad Reed—all started to close up as Tomac slowed the pace. Now Tomac had the numbers he needed to get between he and Dungey in the points, and finally he slowed enough for Dungey to pass him … and then Tomac stood Dungey up in a corner again! Dungey even found himself completely off the track, things were turning crazy as the chase pack closed, and the fans, already emotionally exhausted after the 250 race, found their heart rates launching back up in lockstep with the riders. It had turned insane! Tomac’s plan started to work! As the pack slowed and closed, Dungey had no choice but to pass Tomac or risk getting passed by others, but then when he would go by, Tomac would instantly blast him with another block pass and stand him up—although, post race, Tomac was sure to remind us that he made sure to never go over the line and try to aim straight for his leg and try to hurt him. But Dungey had help in training partner Jason Anderson, who was in third. Tomac, though, had help in teammate Josh Grant, who was right behind Anderson, after Baggett bobbled and crashed. And then, of all people, here came Chad Reed, suddenly rejuvenated and fired up, and turning by far the fastest laps of the race. While Tomac and Dungey scrapped for first and second, Grant cased a huge jump while running fourth, and Reed slipped past. Then Reed passed Anderson for third and the crowd gasped thinking of Reed going after Dungey for second, until Anderson responded with a massive block pass on Reed that sent the veteran into the tuff blocks. Anderson couldn’t even jump the finish line jump because he worked the corner angle so hard to block Reed, and Tomac and Dungey found themselves far ahead again. So Tomac just slowed Dungey up some more, and on the last lap, Anderson and Grant had caught them again, and Tomac set Dungey up again, letting the champion go around him to set up one more big block pass. Four turns to go, Tomac was block passing Dungey again, and finally Anderson in third had nowhere to go except around, and he took the lead and ended up scoring his first win of the season. Grant snuck past Dungey as well to take third, and Tomac finished second, basically sacrificing a win to take one last shot at Dungey on the last lap. Dungey finished fourth, which was enough to wrap the title. Immediately after the race, Dungey was heated and said on TV that the Kawasaki guys were giving him “cheap shots.” In typical Dungey fashion, he apologized in the post-race press conference. Much was made of last week’s Red Bull KTM move with Marvin Musquin (who crashed out of the Las Vegas main) moving over to give Dungey a win. This time it was Tomac’s teammate, Josh Grant, who rode well all day in hopes of stealing some points from Dungey. In the pits after the race, a tale of two groups: The KTM group, celebrating a 450SX championship and the 250SX East Region title with sister company Husqvarna, and a somber Kawasaki gang, having seen title shots for Savatgy and Tomac both go by the wayside in races that came down to the last lap. It's a night of drama in Las Vegas that could truly live up to any other.